Take it easy in this spacious and comfortable chair and a half. 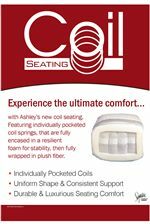 It features luxurious 100% leather in the seating areas with matching vinyl everywhere else, while the seat cushion is constructed with individually pocket coils encased and foam and then wrapped in fiber for consistent, durable comfort. 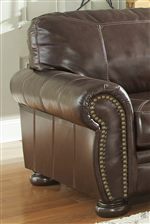 Rolled arms with nailhead trim and rounded bun feet offer classic sophistication to its look. Accent stitching emphasizes the upscale design for your living room decor. The Banner Traditional Leather Match Chair and a Half with Rolled Arms, Nailhead Trim, & Bun Feet by Signature Design by Ashley at Walker's Furniture in the Spokane, Kennewick, Tri-Cities, Wenatchee, Coeur D’Alene, Yakima, Walla Walla, Umatilla, Moses Lake area. Product availability may vary. Contact us for the most current availability on this product. The Banner collection is a great option if you are looking for Traditional furniture in the Spokane, Kennewick, Tri-Cities, Wenatchee, Coeur D’Alene, Yakima, Walla Walla, Umatilla, Moses Lake area. Browse other items in the Banner collection from Walker's Furniture in the Spokane, Kennewick, Tri-Cities, Wenatchee, Coeur D’Alene, Yakima, Walla Walla, Umatilla, Moses Lake area.